Join us on Friday, September 29, 7:30pm for Program 9 of the Unseen Festival: Did You Wonder Who Fired the Gun? The evening features Travis Wilkerson’s Did You Wonder Who Fired the Gun? and is preceded by a reading curated by Brandi Homan, featuring Laird Hunt. Travis Wilkerson will do a Skype Q and A after the screening. Troubled by a story about his great grandfather S.E. Branch’s involvement in the murder of an unarmed black man named Bill Spann in mid-century Alabama, filmmkaer Travis Wilkerson traveled to the small town of Dothan to investigate the rumours. What he found, and what we watch and listen to him deliberate upon, was not news of a single murder, but an entire history of racism and brutal violence against the local black community. Branch, he discovers, was an outspoken bigot linked to multiple instances of violence and abuse against black men and women. With only a pair of vague news clippings and Spann’s death certificate as evidence, Wilkerson proceeded to trace the entwined fates of the Branch and Spann families. When, in the course of his research, Wilkerson discovers that his mother’s sister is a practising white supremacist, the film takes on an increasingly disturbing urgency. Seated in front the screen, unable to divorce himself from his own complicity in this ongoing story, Wilkerson forcefully prompts one of the most powerful reckonings in recent American cinema. Video. Color/Sound. 2017. 88 mins. A chance meeting in Havana with legendary Cuban film propagandist Santiago Alvarez changed the course of Travis Wilkerson‘s life. He now makes films in the tradition of the “third cinema,” wedding politics to form in an indivisible manner. 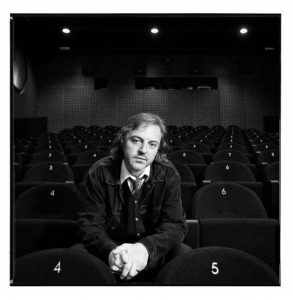 In 2015, Sight & Sound called Wilkerson “the political conscience of American cinema.” His films have screened at scores of venues and festivals worldwide, including Sundance, Toronto, Locarno, Rotterdam, Vienna, Yamagata, the FID Marseille and the Musée du Louvre. His best-known work is an agit-prop essay on the lynching of Wobbly Frank Little called “An Injury to One,” named one of the best avant-garde films of the decade by Film Comment. His most recent fiction feature, “Machine Gun or Typewriter?” premiered at Locarno 2015 and was awarded Best International Feature at DokuFest (Kosovo). It has since screened worldwide and was recognized as one the finest films of the year on numerous lists including La Furia Umana and DesistFilm. His writings on film have appeared in Cineaste, Kino!, and Senses of Cinema. He has taught filmmaking at the University of Colorado and Film Directing at CalArts, and was the inaugural Visiting Fellow of Media Praxis in the Pomona College Media Guild. Presently, he is a Visiting Assistant Professor of Film at Vassar College. He is also the founding Editor of Now: A Journal of Urgent Praxis. Laird Hunt’s writings have appeared in the Wall Street Journal, the New York Times, the Los Angeles Times, the Washington Post and in many literary journals here and abroad. He is the author of Neverhome, The Evening Road and, forthcoming in 2018, Red Boy. 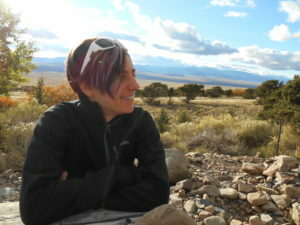 Dani Rado received her PhD in Creative Writing from the University of Denver. Her fiction has appeared in Harpur Palate, Clackamas Review, Mochila Review, Liar’s League NYC, Unstuck, The Other Stories, Tusculum Review, among other journals. She lives with her wife in Denver. Brandi Homan holds a PhD in English, Creative Writing (Prose), from the University of Denver and is the author of two books of poetry, Bobcat Country and Hard Reds, from Shearsman Books.